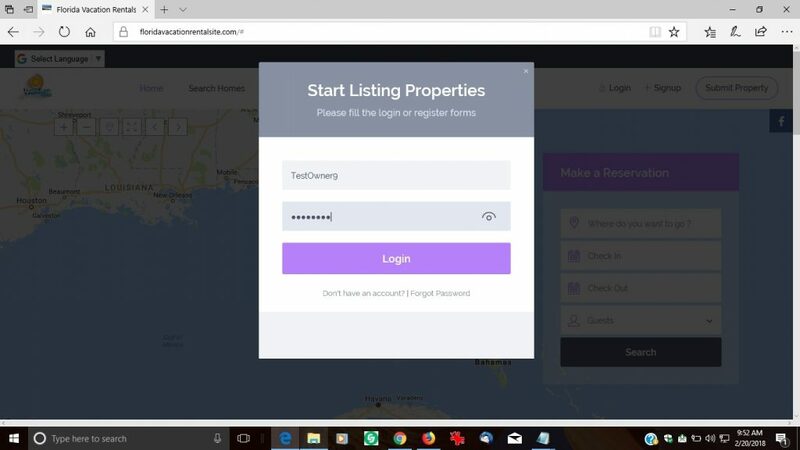 New and improved owner portal is here. We are excited by our upgraded website which will more user friendly both for people looking for vacation rentals and for owners to add and manage their properties. 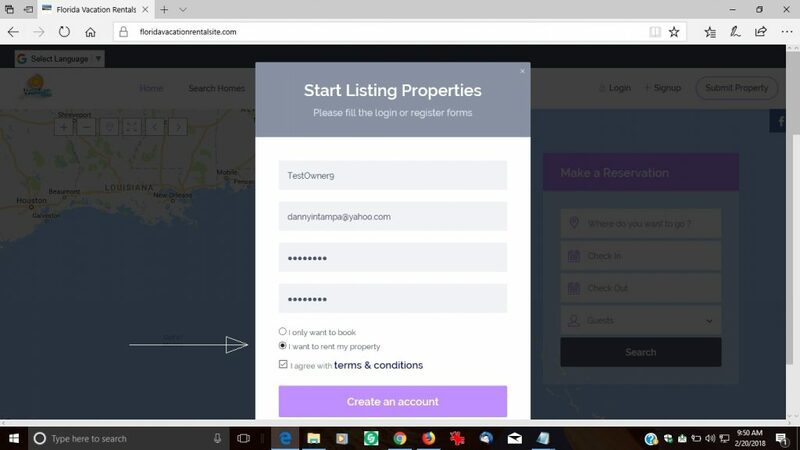 2) Now you add your username email and password make sure you check off I want to rent my property box and click read agree to terms box. 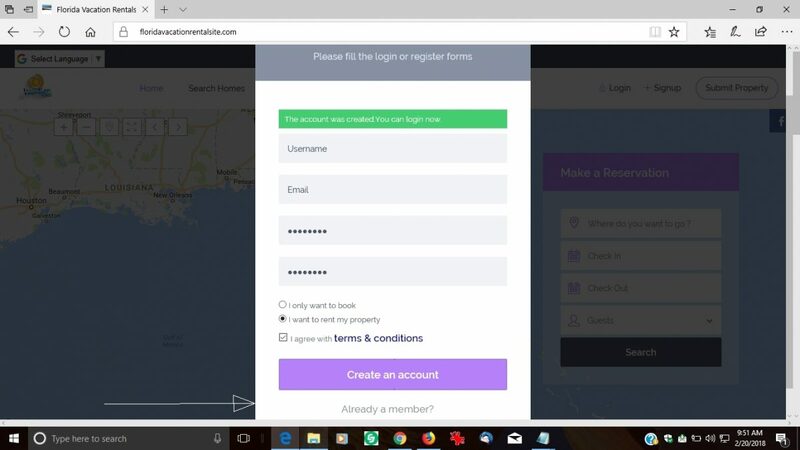 4) Now just put in your username and password you just created. 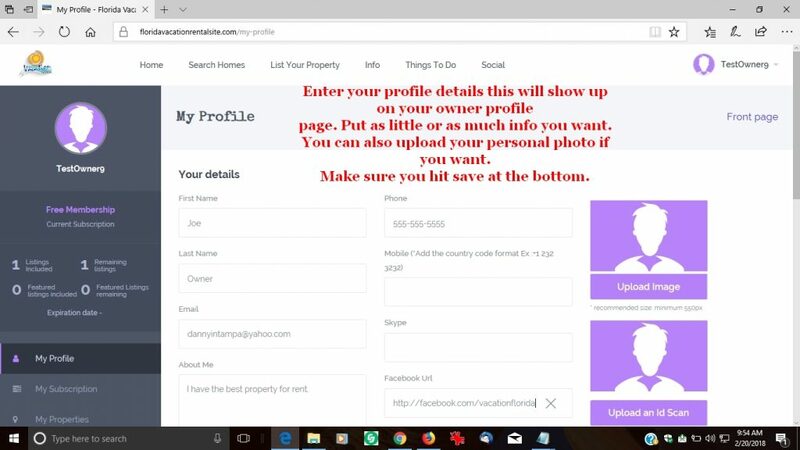 5) Now you can update your owner profile most of it will show up on your owner page. 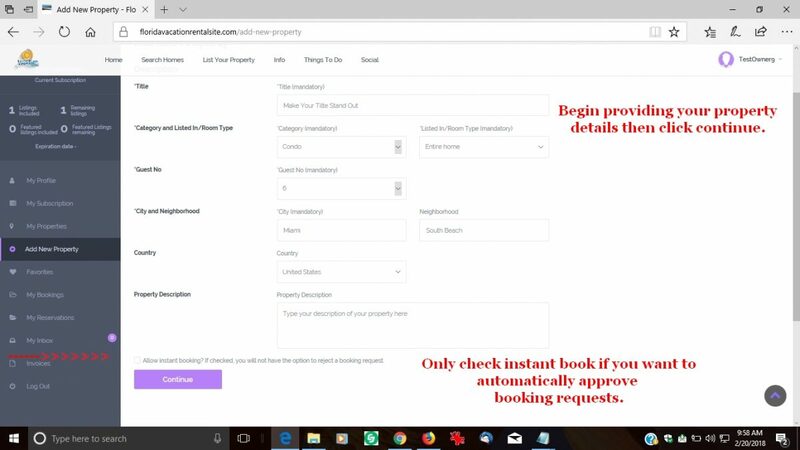 6) Now to begin adding your property click on the left tab that says add new property. Enter your property details then click continue.Only check instant book if you want to immediately approve booking request. 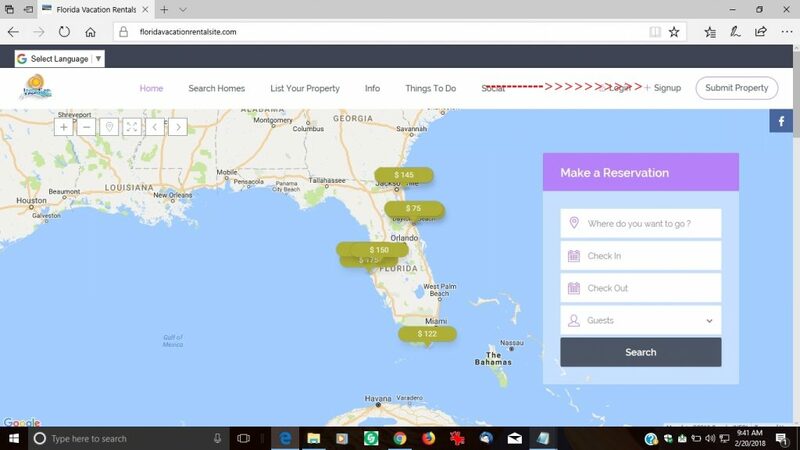 7) Now you can add the base price plus any taxes, and other fees etc.It’s best to save your base price fees then go back to price adjustments it will take you to the next step which is images when you hit save but you can go back to price and make the price adjustments now or any other time. 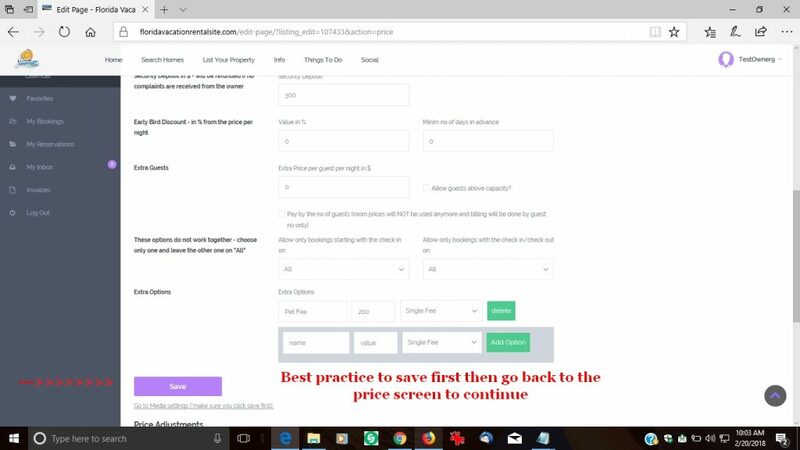 8) Click save and click price again.Now go to the bottom to the price adjustments. 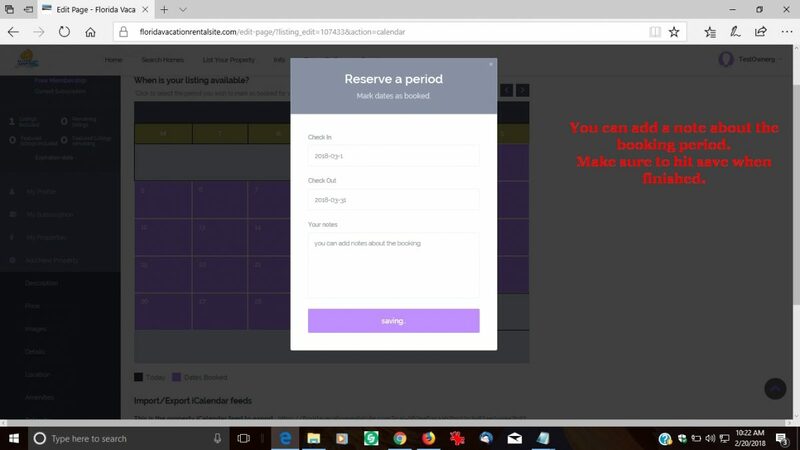 If you have a busy or slow booking period you can change the base price for any period you want.Just click on a begin and end date and a popup will come up. 9) In the popup confirm your dates and click set price for period. 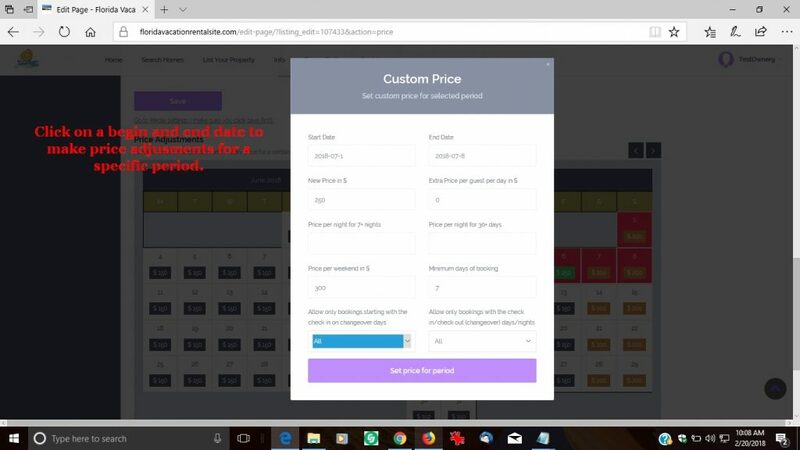 10) You will now see the price adjustments for the dates in the calendar. Click save to take you to the next step adding images. 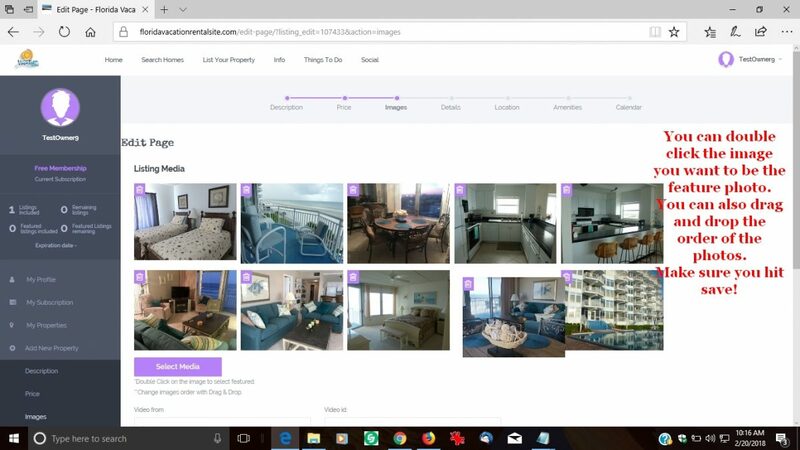 11)Add images from your local computer. 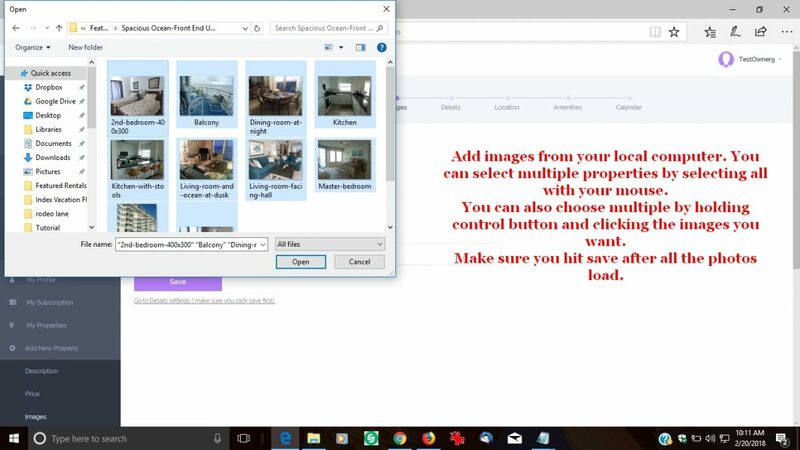 You can select multiple photos at once. 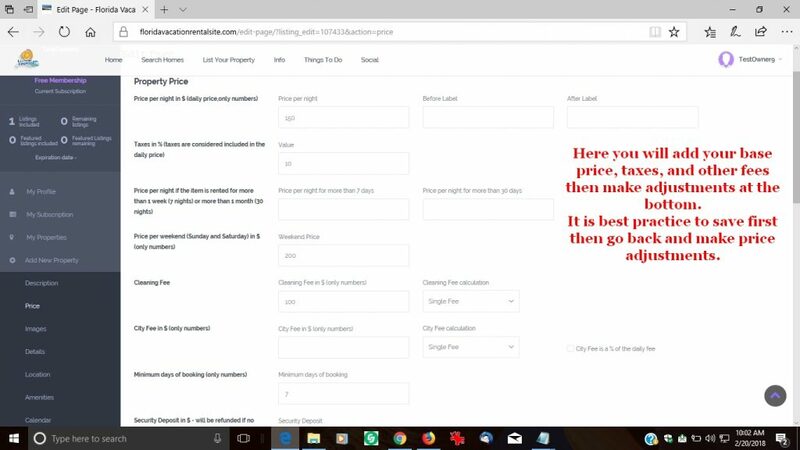 Once they are downloaded you can change the order by drag and drop and select the feature image by double clicking on it. 12) Once they are downloaded you can change the order by drag and drop and select the feature image by double clicking on it.Make sure you hit save which will take to to the next step listing details. 13) Here simply enter your property details then click save to take you to the next step location. 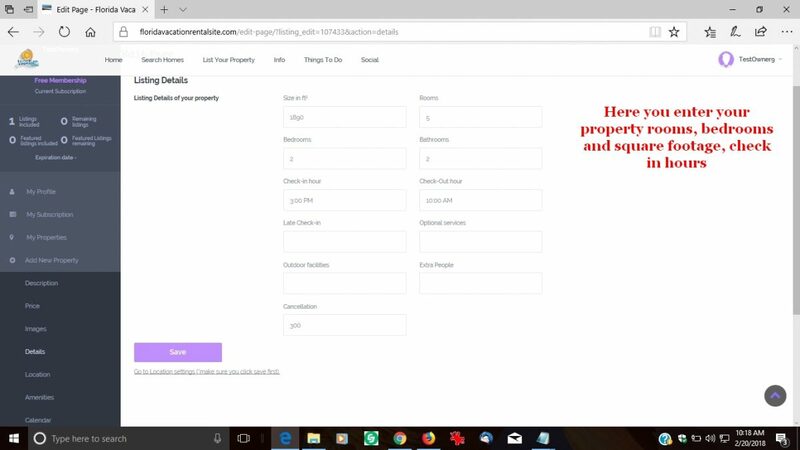 14) Type in your property address then click place with pin button. You will now see the pin in your location make sure you click save to go to the next step amenities. 15) Here simply add all amenities that apply to your property and click save to take you to the next step calendar. 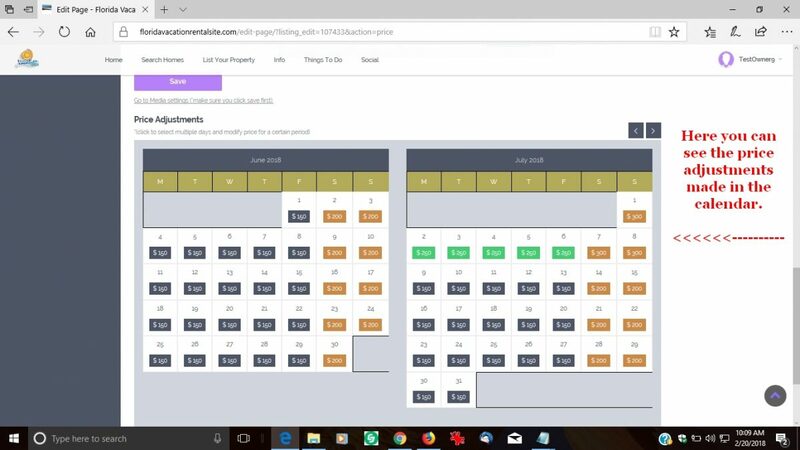 16) Select a begin and end date for a period you already have booked a popup will come for the dates you select then you can add a note about the booking period. 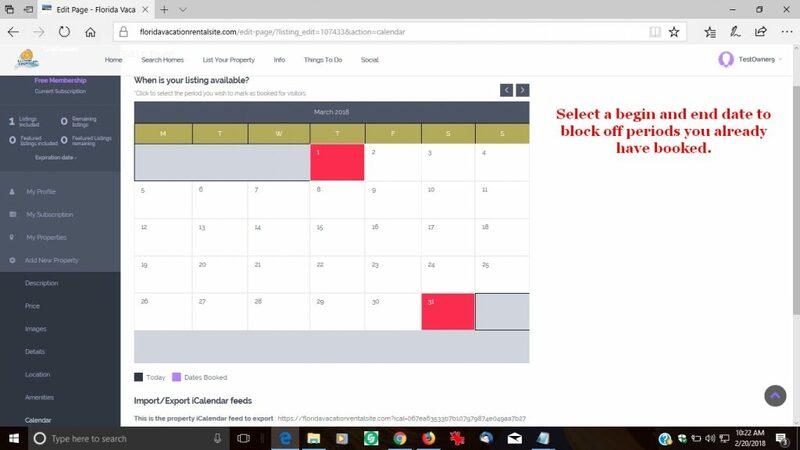 17) Click save when you finished with all the booking periods you selected. 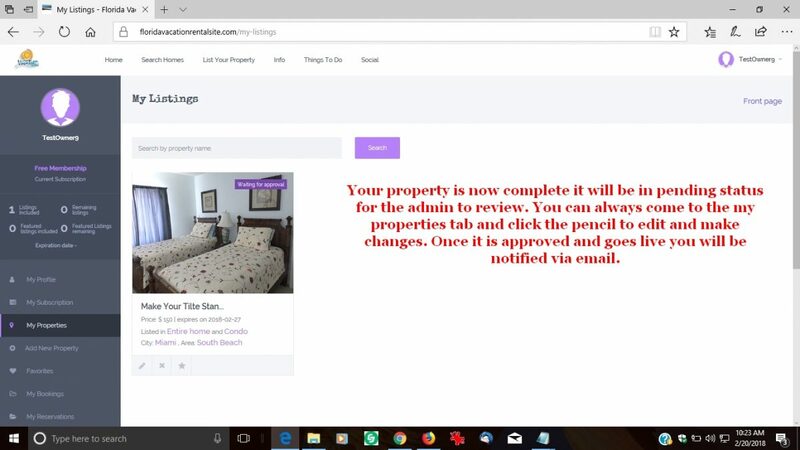 18) Your property is now complete it will be in pending status for the admin to review. You can always come to the my properties tab and click the pencil to edit and make changes. Once it is approved and goes live you will be notified via email.